Learner Permit Requirements — Connecticut Driving school Inc. 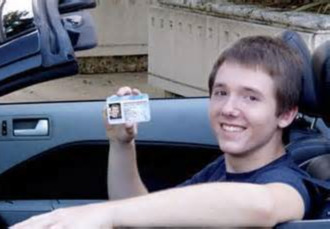 If you are under the age of 18, you must obtain a Learner's Permit to practice driving and hold it for 180 days (120 day if completing a commercial or secondary driver training course) prior to being able to test for a driver's license. The permit allows the student to practice with a licensed driver who is at least 20 years old and has held a license for a minimum of four consecutive years. Driving without a permit is a Violation of State Law and could extend the waiting time necessary to apply for a Connecticut operator's license. Applicants must wait until their 16th birthday before they can apply for a Learner's Permit. Applicants must pass a vision and a 25 question knowledge test in order to obtain the Learner's Permit. The latest edition of the Connecticut Driver's Manual should be studied prior to testing. Knowledge testing is conducted at the following DMV offices on a walk-in basis: Bridgeport, Danbury, Hamden, Waterbury, Wethersfield and Willimantic. Thursday: 9:15 a.m. to 4 p.m.
acceptable forms of identification. Photocopies of documents are not acceptable. In accordance with the Social Security Act 42 U.S.C. 666 (a) (13), it will be required that the Social Security of any applicant applying for a new Connecticut driver's license or Learner's Permit be recorded on the application for a Non Commercial Driver's License and/or Learner's Permit. Notice: If you're not a citizen of the United States, you will be required to show proof of your legal in this country. Holders of a B1 or B2 Visitor's Visa are not illegible for a driver's license or identification card unless a valid Employment Authorization Card (EAC) and verification of an application pending for Lawful Permanent Residence is provided. Foreign students with an F1 Visa status must show Immigration and Naturalization Service (INS) document I-20 and verification of current enrollment in a Connecticut School. J1 Visa holders are required to show INS document IAP-66. All applicants will be verified through INS for legal status before a driver's license/identification card will be issued. Fees: Applicants requesting a Learner's Permit examination will be required to pay a test fee prior to taking the vision, knowledge test $40 fee for vision, Knowledge and road test and $19 fee for learner permit. There are two parts to the permit test. First, a vision test is administered, followed by a knowledge test consisting of 25 questions. Minimal vision is evaluated for at least 20/40 in the better eye with or without glasses or contract lenses. Peripheral vision (sight to either side while looking straight ahead) must be 140 degrees or 100 degrees for persons with one eye. If you fail the vision test, you need to visit an eye care professional. In Order to pass the knowledge portion of the test, you must answer at least 20 questions correctly. The test is based on the latest edition of the Connecticut Driver's Manual for new Drivers. D.M.V. has consolidated the Learner Permit knowledge test and the driver License knowledge test into one comprehensive 25 Question Test. This test will be administered before issuing a permit. If the applicants fails the knowledge test, he/she must wait at least 7 business day before re-testing. There will be a fee collected each time the applicants tests. The Department of Motor Vehicles advises the permit holder to check with proper authorities if planning to drive outside of Connecticut. Learner's permits are not valid in all states. Please contact the state in which you plan to drive for verification.